Discussion in 'Civ3 - Creation & Customization' started by Cimbri, Mar 7, 2010. In 1996, the small nation of Rwanda launched an invasion of dictator Mobutu Sese Seko' state of Zaire. The reason of the invasion was to protect the Congolese Tutsies (or Banyamulenge) living the Kivu province, kins-people of the Rwandan Tutsies, who suffered violence at the hands of Rwandan Hutu extremists (mostly the Interahamwe, perpetrators of the Rwandan genocide in 1994). These Hutu militants had fled to eastern Zaire when the Tutsi rebel group RPF (Rwandan Patriotic Front) drove them out of Rwanda in the wake of the 1994 genocide. The even the numbers a bit, Rwanda created and armed the Congolese anti-Mobuto rebel group AFDL (Alliance of Democratic Forces for the Liberation of Congo) to spearhead the invasion, and they quickly made their way towards Kinshasa. By mid-1997, Mobuto was overthrown and dead, and the Congolese AFDL commander Laurent-Désiré Kabila declared that the state should henceforth be known as the Democratic Republic of the Congo, while assuming the role of president. He swiftly assigned Rwandan Tutsies to important government roles in effort to please his former backers. However in 1998, subject to domestic pressure, president Kabila expelled the Rwandans from government, presumably fearing a coup, and replaced them with native Congolese. This moved angered Rwanda, and was a cause of concern to the Congolese Tutsies. Thus Rwanda immediately formed the rebel group RCD (Rally for Congolese Democracy) in the city of Goma, located in the Kivu province of eastern Congo. RCD was predominantly composed of Congolese Tutsies, and they set about removing Kabila from power. Seeing an opportunity, Uganda jumped into the fray, officially supporting the RCD, but with the aim of propping up their own rebel group the MLC (Movement for the Liberation of Congo) in the province of Équateur in northern DR Congo. The small nation of Burundi also joined in, siding with Rwanda and the RCD. Rwandan soldiers high-jacked a military aircraft from eastern Congo and landed forces by the Atlantic coast to capture Kinshasa. The Rwandan alliance recruited mutinous FARDC (army of DR Congo) and former AFDL soldiers and began to move on Kabila from east and west, indicating an easy victory. In response to this, several African states, among them Zimbabwe, Angola, Chad, and Namibia, came to Kabila's aid, with promises of rewards akin to lucrative mining rights. The Kabila government also responded by propping up their own armed groups in the east, Mai-Mai militias, and supporting the anti-Rwanda/anti-Tutsi Hutu militants in the Kivu province. A brutal free-for-all conflict was about to begin, where millions of Congolese civilians dies at the hands of rampaging militias, while foreign nations pillaged and plundered the already poor nation. This is where the scenario begins, as Rwanda and the RCD are moving on the capital Kinshasa. Can you end the conflict before it turns into a bloody stalemate? I decided to keep it simple. the basic units include three types of infantry, an assault truck, and some non-buildable units like helicopters, gunships, tanks, APCs, fighters, and bombers. This is a Conquest Scenario. There are victory points placed on some of the important resources mostly in the two central Kasai provinces and in the eastern Kivu province. 27-03-2011: I am going to redo the units. There are a couple of African machine gunners available now from Wyrmshadow. I'll find a place for them in this scenario, I think. Ammunition, Weapons, Petroleum, and Spare Parts are used for combat units. the various rebel groups do not posses these, but they can be supplied by the involved nation states and the neutral states. Capturing resources to trade for these items is of vital importance. Natural resources include diamonds, cobalt, coltan, gold, timber, copper, and tin. Victory Point generating wonders can be built when you control these resources. DR Congo, a large state with many cities and a scattered army. You most move swiftly to stop the onslaught from the invading enemies. You should consider arming the Hutu factions in the east and the unruly Mai Mai militia factions in the Orientale and Katanga provinces. Oh, and if you look to the north-west in the Ituri province, you find the anti-Uganda/anti-Hema Lendu tribal faction FNI (Nationalist and Integrationist Front). RCD, the Rally for Congolese Democracy, militarily the most powerful faction in the game. However there are potentially dangerous and well armed Hutu and Mai-Mai factions operating in your rear areas, factions like the ALiR (Army to Liberate Rwanda) and the FDLR (Democratic Forces for the Liberation of Rwanda. They did not exist in 1998, but was created later. I decided to include FDLR anyway). But you can also draw support from the well-armed Tutsi faction in the Kivu province or try to purchase the loyalty of the Mai-Mais. It is vital that you acquire strategic resources from Rwanda or Burundi or you'll be stuck with militia. Rwanda, a small state with a large army. You are threatened by the nearby Hutu factions in eastern DR Congo. You are in a Locked Alliance with the RCD. Provide them weapons and ammunition or their offensive will stall. Uganda, a small state with a large army, this faction also have to contend with a hostile rebel group in DR Congo, the ADF (Allied Democratic Forces) and the dangerous Lord's Resistance Army, occupying northern Uganda. There is a faction of Hema tribal militants in the Ituri province of DR Congo, who might provide good allies, and of course your Locked Alliance with the MLC and the RCD splinter faction, the RCD-K/Mouvement de Libération. They are dependent on you supplying them with weapons and ammunition. 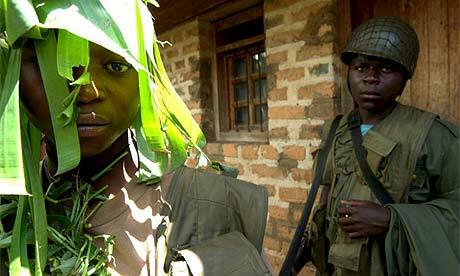 MLC, the Movement for the Liberation of Congo, is a powerful rebel group in northern Congo in the Équateur province. The HQ is in the town of Gbadolite. You enjoy a Locked Alliance with Uganda and you're dependent on Ugandan arms and ammunition. Be advised that you share a border with elements of the Lord's Resistance Army, enemies of your ally Uganda. Angola, this is the most powerful of Kabila's allies. It is a large country with a substantial army featuring tanks and aircraft. However, the north-eastern parts of Angola are occupied by Jonas Savimbi's powerful UNITA faction. Be careful, they'll start out near Luanda and they have a decent military. RCD and Rwandan troops push on Kinshasa. Namibian troops can be seen near the airfield. Hutu and Tutsi factions in the Kivu province of DR Congo. Goma is the HQ of the largest RCD-faction. RCD and Rwandan troops attempt to cut DRC in half by conquering the two Kasai provinces. No, I haven't forgotten about my ACW scenario. This is just a side project. Oh! Very exciting! I'll definitely give this a play! The Northern Front - FARDC/DR Congolese Army, Chadian, and Zimbabwean troops gather in the Équateur province to meet the MLC forces. The Southern Front - Friends? Zimbabwean and Namibian troops march north to secure the Kasai province victory points in the face of advancing RCD militants. Africa is unfortunately a seldom explored field, scenario-wise anyway. This scenario though, might be a bit difficult for people unfamiliar with recent events in central Africa... which I assume is most of the people here. But I hope this scenario will introduce this neglected African disaster to some people who might take notice and read into it. Anyway, I'm looking forward to trying you work too. Just downloaded the beta. Your right, there are not enough scenarios about Africa and unfortunately people are seldom aware what happens there. When there is a war in Iraq the whole world knows everything that's happening. But when a war involves only third world countries, it gets hardly any news coverage. You're going to need to severely nerf the Militia unit. All Terrain as Roads and Enslave? Its hard for me to imagine the AI building anything else but these guys. Regular forces in the 2nd Congo War for the most part just guarded mines or other important sites. Irregular militiamen did most of the fighting, especially as the war dragged on. But I think I might beef up the Infantry to 4 in defence. Oh, and by the way. I noticed your work with flags. I'd like to add flag leaderheads to the game. Right now every civ uses the Zulu leaderhead, which is a shame. I've got designs for various militia/rebel flags and I'd like to add those to the game. I just added another Hutu faction in the Kivus, the FOCA (Forces Combattantes Abacunguzi) allied to the FDLR. So that brings the Hutu groups up to four total, with one anti-Burundi group FNL (National Forces of Liberation) based in primarily in Tanzania refugee camps and with additional units in the Kivus. MaisseArsouye wrote a tutorial for making static Flag LHs back in 2005. All that's needed is any PCX editor and Animation Shop 3 (Jasc Software). Disturbing that it seems most of it has flown under the radar of the mainstream press/media. I will give it a try when you release it. There are no victory points in cities. They're all on top of mineral resources. As a rebel faction, you can capture resources and trade them for arms and money, and allowing your allies to build wonders called, for example, Gold Export. In my test runs, I notice that my allies will occupy VP's in my territory. In the actual Second Congo War, Rwanda and Uganda and their proxies, despite being anti-Kabila allies, clashed in Congolese cities in battles over resources. African scens are much needed. Boer Wars, colonial wars... massacre after massacre, ignored. What about the Algerian independence? Cool, thanks! I'll look into it. You can use GIMP for it. Looking good. I want to play this. This kinda makes me a little disgusted. I'm sorry, scenario looks cool and all, but I don't think you should be using such a horrible tragedy as this to provide entertainment for others. Just my view. You know what's the rage this year? ...Hats. Sure. Maybe we should dump the Napoleonic Wars, World War 1 & 2, Rise of Rome, and every other disaster scenario as well? Or do those not rate as tragedies? I love DR Congo, it's people, and it's history. This is an ugly business that nobody knows about, ignored by most. I'm bringing this into civ because I feel like it. Feel disgusted. You should. 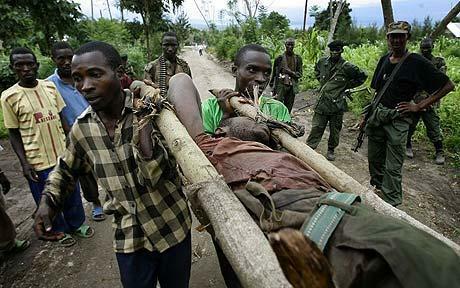 Groups like the FDLR is still out there. Still killing while the UN mission in DR Congo is about to withdraw. Because apparently nobody gives a damn! My thoughts exactly Cimbri. We don't build scenarios to glorify what happened. We build them because we have an interest in history and we use our love of the game to understand what happened and not forget. If we wanted to eliminate every sort of entertainment that focused on historical tragedies then we might as well also eliminate all movies, books and games on wars, floods, terrorism, fires, tornadoes, hurricanes, etc, etc, etc.